“As it turned out I was glad we had waited to marry until he had had a year back home to get adjusted after four and a half years in the army, with two of them overseas and in combat. Also he had time to get established in his job. So late that year , we decided to marry on January 24 . Sara and Russell's first apartment, 208 Walthall Street. 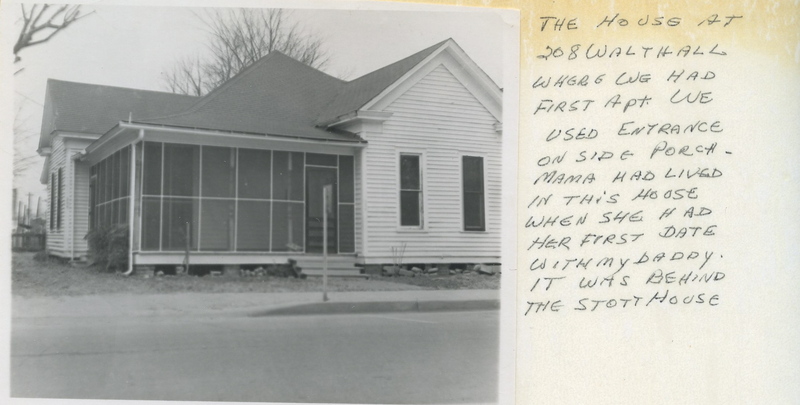 “We, through Uncle Roy, were able to rent an apartment right behind the Stott house for $45 a month, and so we began making plans. “Russell’s boss was C.A.Thompson, who was very strict and demanding, and we were afraid that if we told him we were planning to stay in Greenwood, even though his home base was supposed to be Clarksdale, that he would be fired. So we just did not tell him of our plans. 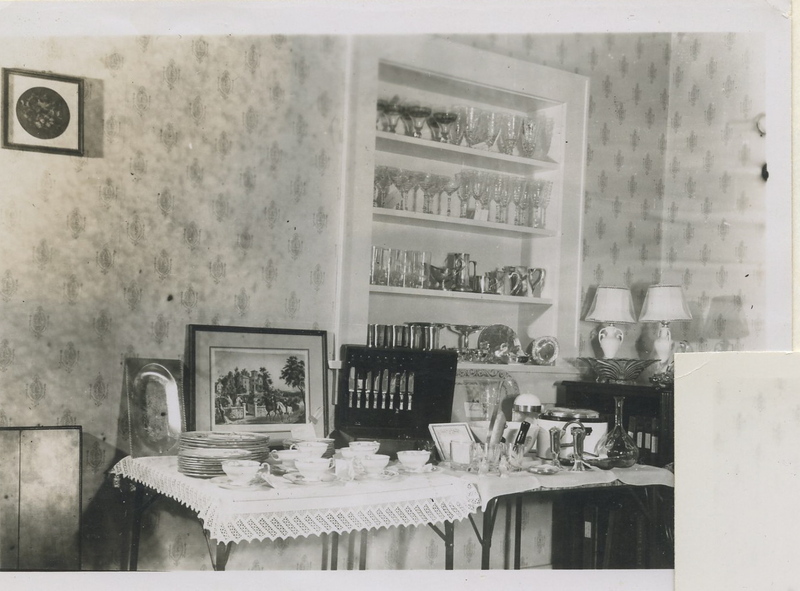 Wedding presents displayed in Walthall Street apartment. 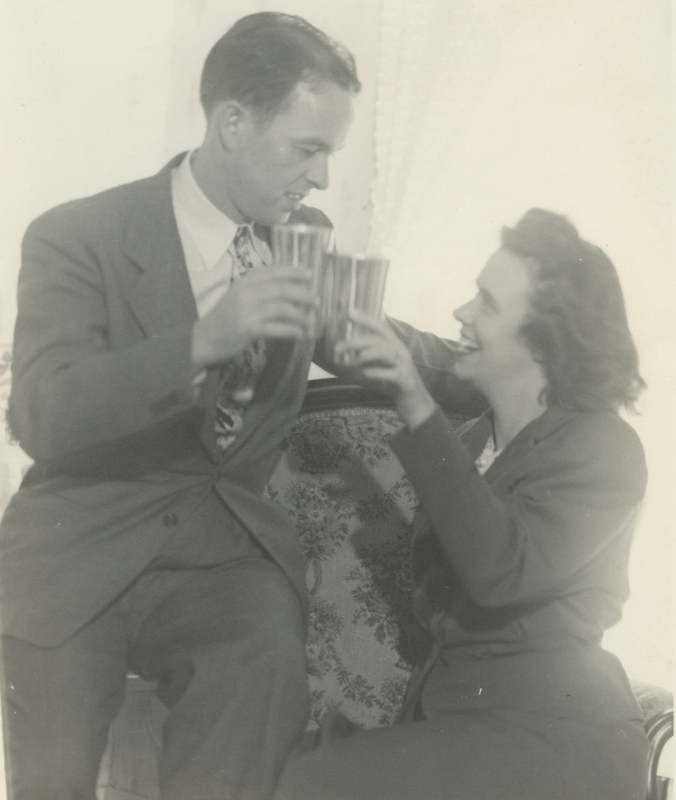 “On January 24, 1947, at four p.m., we were married in Tiny’s living room at her home near Minter City. All of both families attended. G.D. and Mary stood up with us, and Dr. Edward J. Caswell married us. Tricia and Roland Woodruff [Russell’s nephew] lit the candles. Tiny’s mother-in-law, Mrs. Roberson, insisted that we had to have music and put on a recording of ‘I Love You Truly’ in another room so we would at least have music in the background. Auntie [Russell’s stepmother] cried audibly throughout the ceremony. It had poured down rain all day, and Russell had stayed in the apartment miserable waiting until time to go to Minter City. There was so much water standing in Tiny’s yard, Russell had to pick me up and carry me to the car. 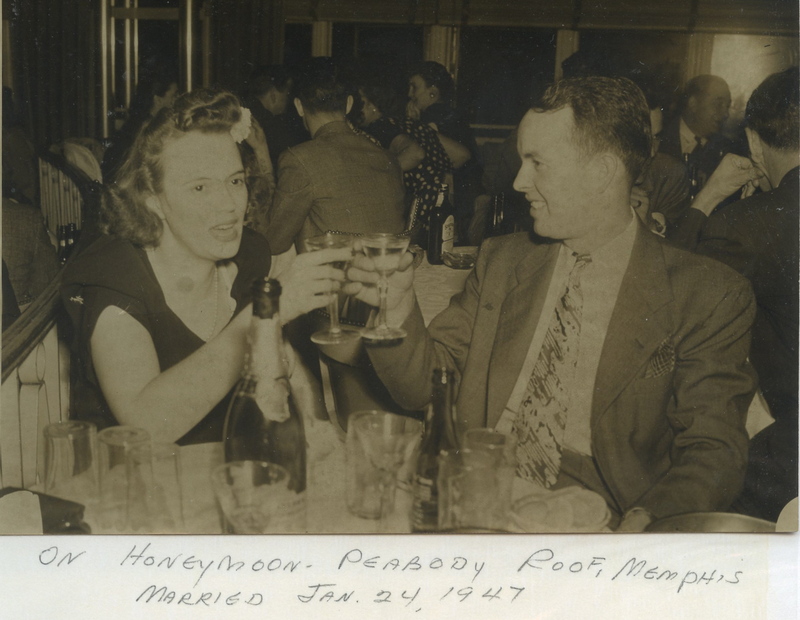 “After having cake and other refreshments we headed to Memphis and the Peabody Hotel, where we were to spend our two day honeymoon. Peabody Roof, January 24, 1947. In a box upstairs, I have that tan gabardine suit. And the brown hat. And the marriage license. And a faded Peabody Hotel receipt for two nights, January 24 and 25, $6.00 per night. Those are priceless. But nothing to compare with the example these two set for Cathy and me. If we’ve had long, happy marriages (and we have, 38 years for hers, 32 for mine), that’s in no small measure due to the standard Sara and Russell set for us. They were just as devoted to each other in 1992 as they were in those pictures above. Now there’s a gift.